“Maddy’s Wings is a heartwarming coming of age story!” Maddy survived and now she wants to know why. Racked with survivor’s guilt and beginning to suffer from Alzheimer’s in her old age, 92-year-old Maddy has a painful recollection stuck on repeat – the moment she crashed a loaded B26 bomber during her role as an Air Auxiliary Pilot in World War II. 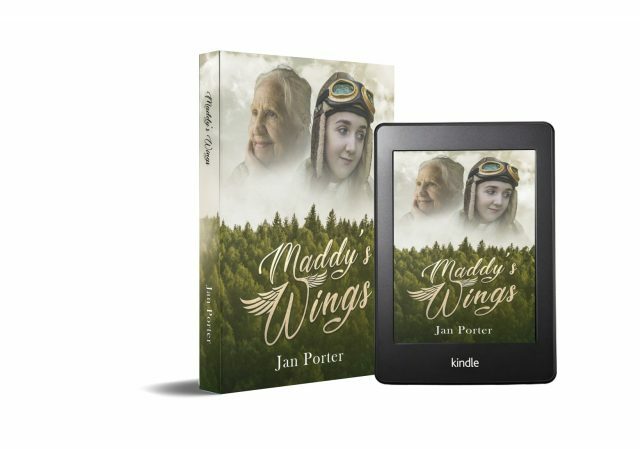 Maddy’s relives poignant memories; growing up during the Great Depression, war traumas, the death of her daughter and unborn grandchild, and yet it is the plane crash that she cannot get out of her head. As Maddy’s memories fade and life draws to a close, she seeks to live her last moments to the fullest. From intriguing new neighbours to a pet pig and giggle brownies, humour and heartbreak abounds as she struggles to shake off the survivor’s guilt that has haunted her for so long. Maddy’s free-spirited adventures are thwarted by a ruthless elder care worker, who is making her life a misery. Strange events unfold – the decades old cold case of a murdered local Pastor surfaces, and shocking truths come to light about little sister Rosie’s life during and after the war. What really caused that fateful plane crash? Why did Maddy survive while others lost their lives? What really happened to her little sister Rosie during the war? As she faces the final challenges of life to set herself free from the shackles of culpability, Maddy may just redefine what it means to be a hero. Award-winning author and philosophical muse Jan Porter brings indigenous cultures, spiritual phenomena and unsung heroes to life in her notable collection of prize winning books. A connoisseur of literary fiction with a strong female lead and universal self-help books, Jan not only seeks to move and entertain with her humorous and heartfelt novels, but also to advise her worldwide audience as they look to her for counsel on angels, spiritual fulfillment and life after abuse. Born in rural Ontario, Canada, contemporary women’s fiction author and self-help guru Jan grew up in the great outdoors, where she was captivated by the otherworldly allure of indigenous cultures, mysticism and tales of northern wilderness.